social roles, like parenthood, are tough to take up. It is tougher to decide when to take it up. Chemical changes take place in the human brain as we adjust to new social roles but the exact method is as yet unclear. The mystery, though, has been solved for the bees. A research unveiled the chemical changes in their brains that direct the social roles they should perform and when. 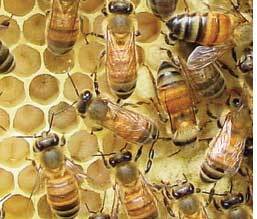 Young worker bees perform tasks like nursing of larvae and maintenance of the hive. Care inside the beehive needs efficient capability to recognize, smell and detect chemicals emitted by the bees. In a couple of weeks, a change in the concentration of the proteins in their brains tells them they should switch over to foraging. Foraging involves memorizing a feeding place, capacity to move about and communication skills.As the functions change, so does the concentration of specific proteins associated with each function. Liudy Garcia of the Brazilian Centre for Protein Research, Brazil and her team found three proteins called Major Royal Jelly Proteins (mrjp) 1, mrjp 2 and mrjp 7 that were higher in concentration in the younger bees. These proteins help in odour recognition. Proteins like alpha-glucosidase, converting nectars into simple sugars, and calcium-binding proteins associated with learning and behaviour were found in higher concentrations in forager bees. "As foraging requires energy, alpha-glucosidase is more expressed in forager bees," explained Marcello Valle de Sousa, one of the authors of the paper. The researchers also found high levels of iron-binding proteins in foragers. "Foragers are exposed to environmental stress which iron-binding proteins protect from," explained de Sousa. The study was reported in the March 6 issue of the Journal of Proteome Research.